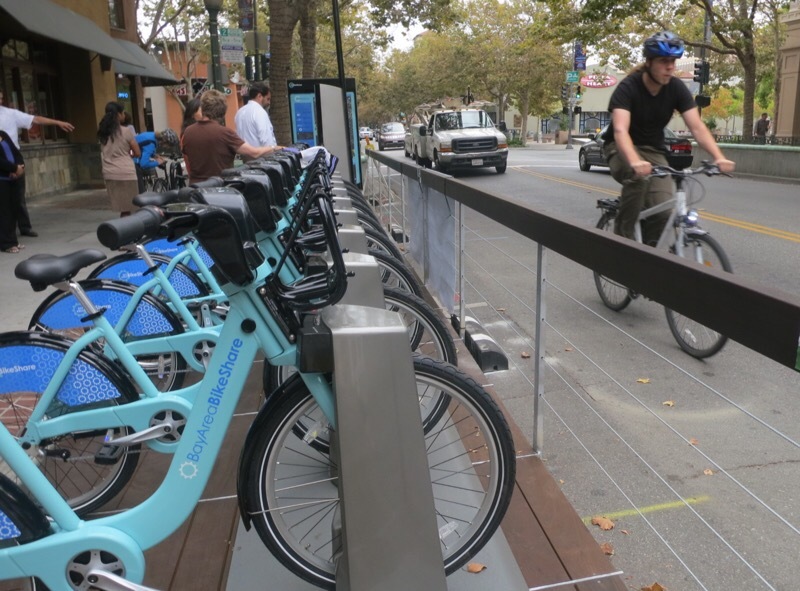 On Tuesday evening, the Palo Alto City Council directed staff to continue contract negotiations for replacing the city’s existing 35 bike-share bikes with 350 new SoBi “smart bikes”. Unlike today’s Bay Area Bike Share bikes, SoBi bikes are equipped with an on-board lock so they aren’t dependent on fixed docking stations to operate. Customers can find the bikes using a GPS-based phone application, and can finish a rental by locking the bike to any city bike rack. “The SoBi hubs are just designated locations, they’re just bike racks,” said Bikes Make Life Better co-founder Amy Harcourt by phone. “They give you the visibility and accessibility of bike share stations but with the flexibility to lock the bikes somewhere else, and at a lower cost.” Harcourt’s firm maintains a 50-bike SoBi bike-share system for the city of San Mateo, unveiled for Bike-to-Work Day this year on May 12. Under the proposal [PDF], Palo Alto would buy its 350 SoBi bikes for $1.16 million, which would be maintained by bike-share company Motivate in exchange for all rental fees and advertising revenues earned from the system. Motivate will also operate an expanded 7,000-bike Bay Area Bike Share system in San Francisco, San Jose, Oakland, Berkeley, and Emeryville, and plans to offer the same membership for renting bikes in Palo Alto as in those cities. In early September, Motivate announced that it had secured a $50 million sponsorship deal with Ford Motor Company for its 7,000-bike system. 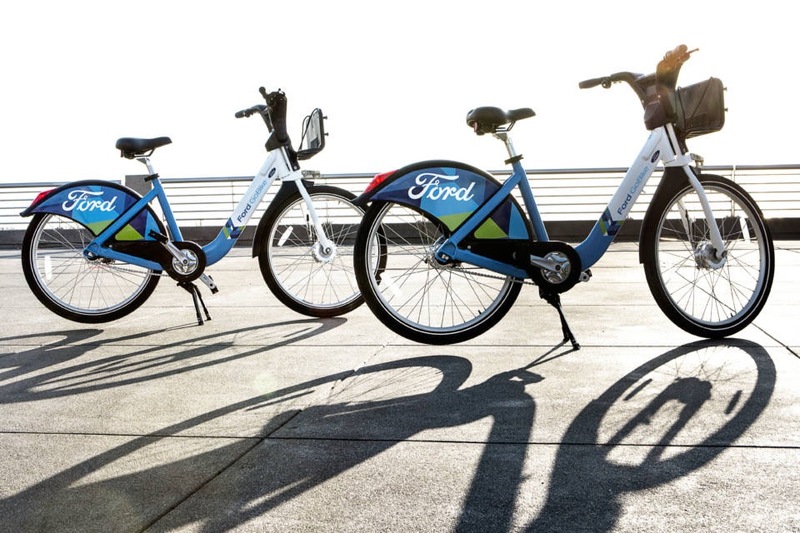 As in the five other bike-share cities, Palo Alto’s SoBi bikes would “in all likelihood” also be branded as Ford GoBike, according to Chief Transportation Official Joshua Mello. The city envisions expanding the bike-share system by another 350 SoBi bikes (for a total 700-bike system) in 2018 using an Metropolitan Transportation Commission (MTC) Bike Share Capital Program grant. “It would be $420,000 per year for another 350 bikes. It’s $100 per bike per month,” reported Mello to the City Council on the operating fees the city would pay on the second 350-bike installment. Unlike the proposed agreement between Motivate and Palo Alto, last year’s deal between Motivate and MTC doesn’t require any up-front or ongoing costs to the five participating cities. Excluded from that deal as well as the current Bay Area Bike Share pilot program, the city of San Mateo struck out on its own, purchasing 50 SoBi bikes and securing a three-year operating contract with Bikes Make Life Better. Currently branded as Bay Bikes, San Mateo is still seeking a sponsor to earn advertising revenue and offset the system’s modest costs. Palo Alto staff concluded that a SoBi “smart bike” system like San Mateo’s would cost less than expanding the city’s existing 35-bike “smart station” system under the current agreement between Motivate and MTC. The flexibility for customers to be able to lock the bikes anywhere (within a specified zone) also appealed to city planners. Uninterested last year in operating its regional 7,000-bike system in “low density” areas, Motivate’s May 2015 agreement with MTC allows the company to remove the pilot Bay Area Bike Share bikes from Palo Alto, Mountain View, and Redwood City entirely. But landing Ford Motor Company this year as title sponsor for the expansion encouraged Motivate to reconsider abandoning the high-tech region. Ford opened its Research and Innovation Center in Palo Alto last year to develop autonomous vehicles, and the auto manufacturer is eager to re-brand itself as a high-tech “mobility company”. Palo Alto staff plan to continue negotiations with Motivate and present a final contract for approval by the City Council in December. If approved, the initial 350-bike system would launch in June 2017. I worry that the Bay Area’s bike shares will become as fragmented as its transit. I wonder if there’s hope of peerage agreements between operators. @mlroach hi Matt, the system will be operated by Motivate and interoperable with our expanded system. More details to come. I have no idea what this looks like, but sounds like there might be some communication. Hopefully “interoperable” means that at least there will be only one membership registration required to access both systems. For example someone should be able to register for one-day access in SF, take Caltrain to PA, and continue using their one-day membership on the proposed PA system. If such a journey requires applying for another membership in PA than such a system really is not interoperable. I do like the SoBi system better since it requires no large investment in specialized bike racks. It is cheaper and more flexible. But if it can’t interoperate with BABS then it is not worth deploying at this time. Will More Bike-Share Systems Opt for “Smart Bikes,” Not “Smart Docks”?